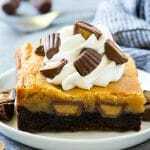 This peanut butter chocolate gooey butter cake is a chocolate cake base topped with peanut butter cups and a layer of gooey peanut butter topping. A decadent and easy chocolate peanut butter cake that’s perfect for feeding a crowd. If you love peanut butter cups, you’ll adore this cake! I make it for birthday parties, potlucks, or any time I’ve got a craving for that chocolate peanut butter flavor combination. A good dessert can take a bad day and make it something extraordinary. Ok, maybe that’s an exaggeration but this chocolate gooey butter cake is that good! This decadent and easy dessert is a total crowd pleaser that both the adults and kids will enjoy. HOW DO YOU MAKE CHOCOLATE GOOEY BUTTER CAKE? To make this gooey butter cake, simply mix up your ingredients for the delicious cake crust and press it firmly into the pan. The best step is next, scatter your peanut butter cups all over the crust before mixing your next set of ingredients. 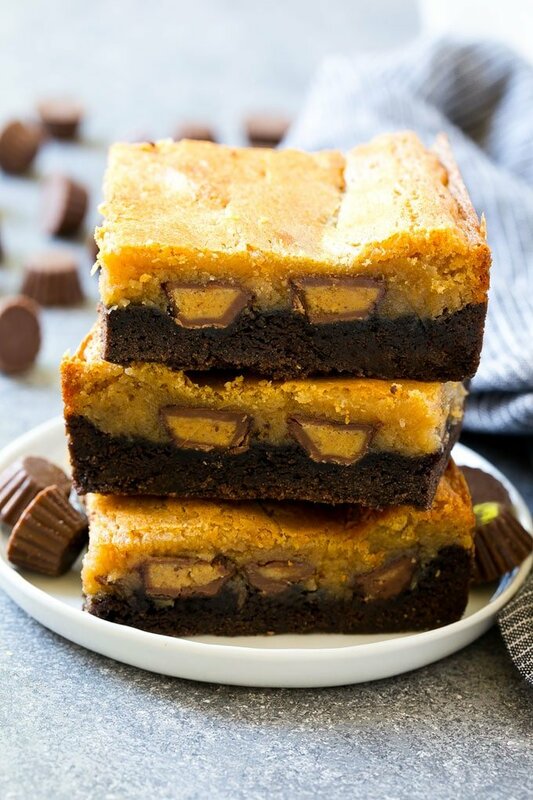 Once you’ve made your smooth peanut butter mixture, pour it over the peanut butter cups and bake until done. Allow to cool then serve topped with whipped cream and pieces of peanut butter cups. This chocolate peanut butter cake will be a hit no matter when or where you serve it! This peanut butter cake is rich (in a very good way) so be warned that serving in smaller squares is strongly suggested. 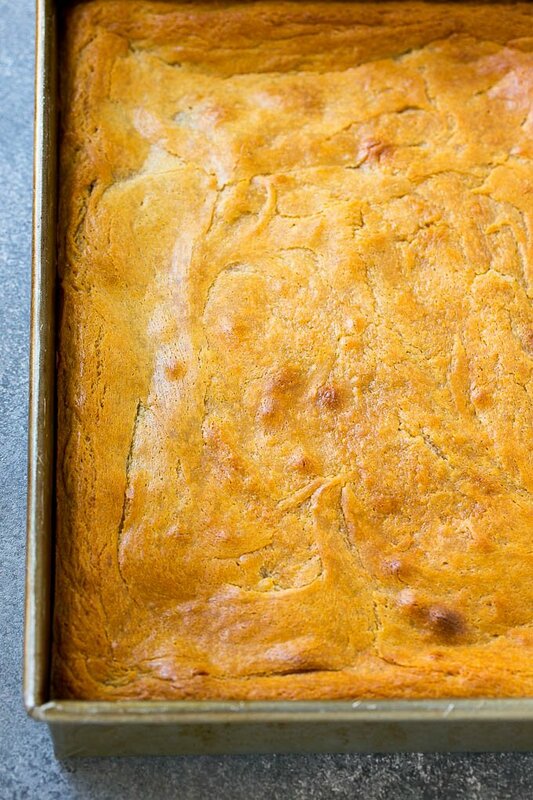 Never fear, your gooey butter cake can be frozen for later or even saved for four days in the fridge. I love serving this peanut butter cake with a lightly sweetened whipped cream and pieces of peanut butter cups. I suggest looking for the bite sized peanut butter cups in the candy aisle. If you can’t locate those, cutting larger peanut butter cups into fourths works as well. HOW DO YOU KNOW IF THE WHIPPED CREAM YOU’RE BUYING IS LIGHTLY SWEETENED? There are many types of whipped cream products on the market, including aerosol cans, heavy cream in cartons you whip yourself, and frozen whipped topping. Typically whipped topping and the aerosol can whip cream contain sugar. However, to ensure you get the level of sweetness you prefer, I suggest making your own as it’s healthier, easy, and tastier, in my opinion. HOW LONG WILL CHOCOLATE GOOEY BUTTER CAKE LAST? If left at room temperature, your cake will last around two days. If refrigerated, it will last around 4 days. If you freeze it, for best taste, eat within the next month or so. Of course, it’s always best to eat the cake the day it’s prepared for the freshest taste. I promise you that I will end up making this cake quite a few times this year. It was SO easy to make and was a huge hit with my guests. Of course, it was a huge hit with the kids and husband as well, not to mention, I definitely ate my fair share! 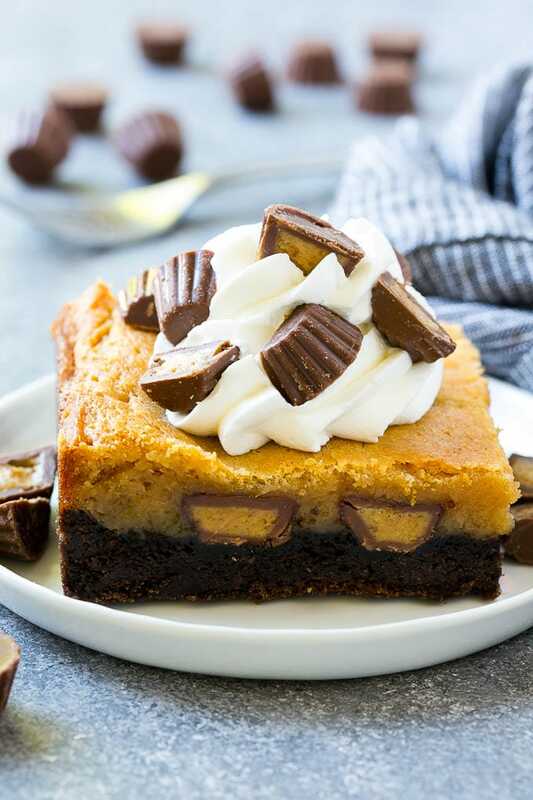 This peanut butter chocolate gooey butter cake is a chocolate cake base topped with peanut butter cups and a layer of gooey peanut butter topping. A decadent and easy chocolate peanut butter cake that's perfect for feeding a crowd. 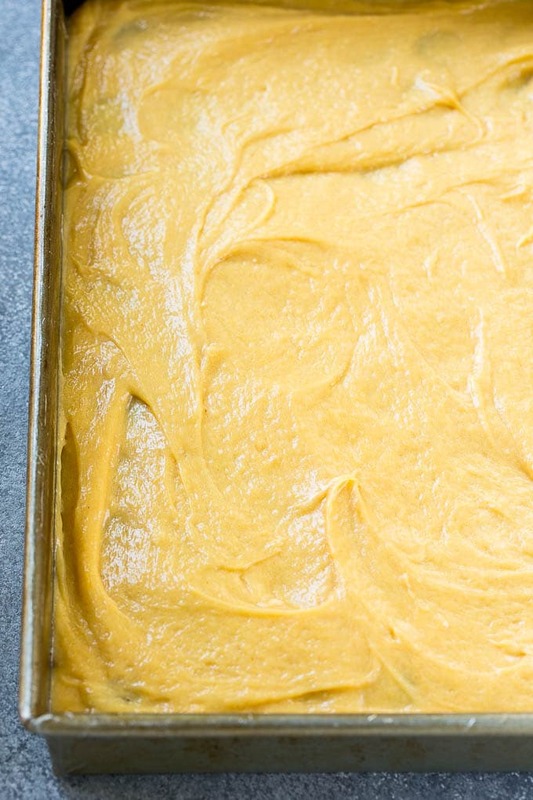 Place the cake mix, 1 egg and 1/2 cup of butter in the bowl of a mixer. Beat until well blended. Press the cake mixture evenly into the bottom of the dish. 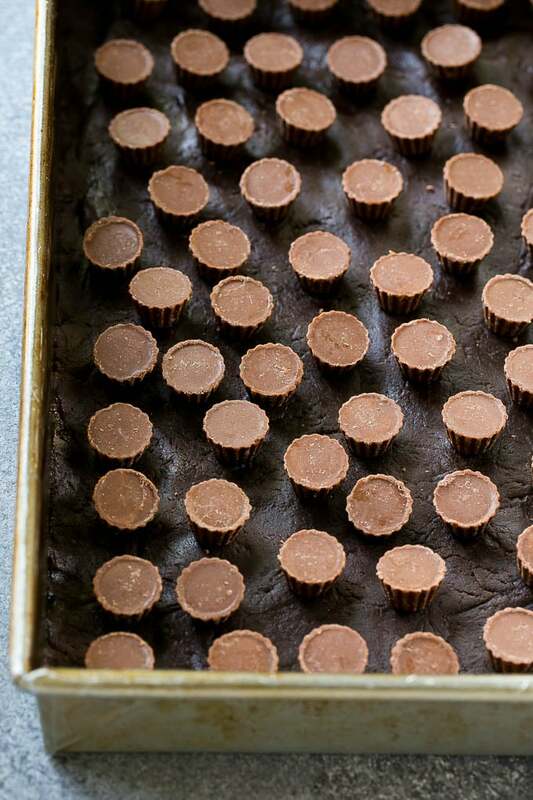 Scatter the peanut butter cups evenly all over the cake layer. Place the cream cheese and peanut butter in the bowl of a mixer; beat until smooth. Add the eggs, vanilla and butter to the bowl, then mix until well combined. Slowly add the powdered sugar with the mixer on low. Mix until just blended. Pour the peanut butter mixture over the cake layer. 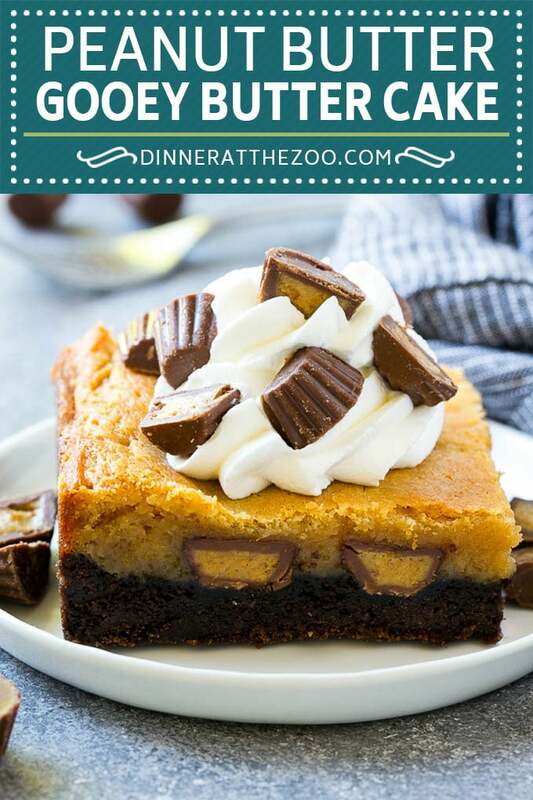 Cool completely, then cut into squares and serve, topped with whipped cream and chopped peanut butter cups if desired. Cake can be made up to 3 days before you plan to serve it. Store the cake covered in the refrigerator. Cake can be cut into squares and frozen for later use. The base of this dessert isn’t like a traditional cake, it’s dense like a brownie. 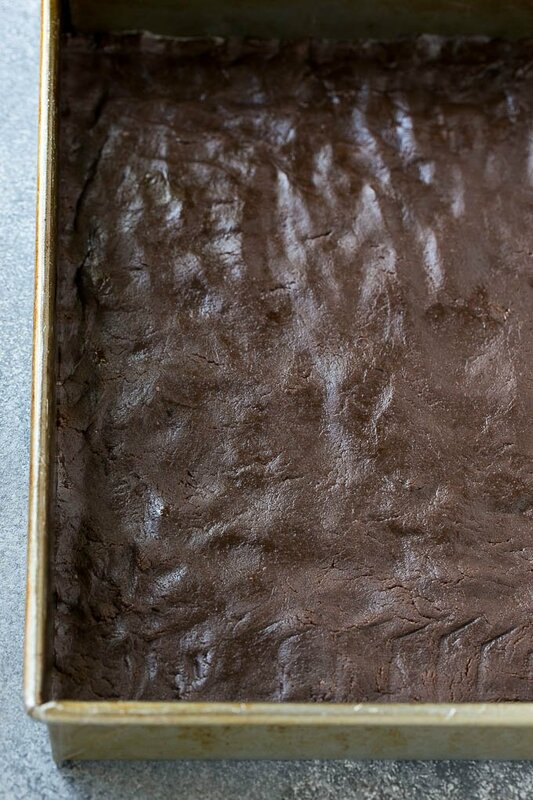 I’d recommend using a homemade brownie recipe. Makes my mouth water as I love anything with peanut butter and chocolate! This looks like a sweet lover’s dream dessert! I am absolutely going to make this over the weekend. Peanut butter and chocolate are my favorite combination! Oh wow, that looks SO good! I’m currently trying to lose 10-15 lbs, so I’m mostly hungry, which is making this awesome cake even more appealing! This looks so delicious although i’m not a “sweets” person. I would love to try a vegan alternative to the recipe. This looks so good! My son’s birthday party is this weekend and I’m going to have to try this out, thanks for sharing! Yes to this! I love anythng penut butter so I know this is a cake that I would love to eat and make! Peanut butter and chocolate are an amazing combination, and this sounds like it would be delicious. Just by watching the photos, I can’t help but drool! I’m loving it!! My mouth is literally watering! This looks so yummy and like the perfect summer treat! This sounds really good. My husband would love this. Ok, so I just heard about gooey butter cake a few years ago. I think it must be a Southern thing. This sounds amazing! My hubby loves anything peanut butter, so I’ll have to give this a try! OMG! If I read the word “gooey” one more time, I think I might melt! This looks soooooo good. Yum! This is a very high calorie yet delicious sounding recipe! thanks for sharing.